While JP spent much of his early childhood years bouncing around from Texas to California to Missouri, he spent most of his early years growing up in South Texas graduating from Edinburg High School in 1991. He has fond memories of the numerous camping trips to New Braunfels arranged by his grandmother when he was a child, and it was from those trips where his love for our community began at an early age. JP moved to Austin right after high school to attend The University of Texas where he studied music & sciences, and was also a member of the Longhorn Band. He met his soon to be wife (Dawn) while at UT, and to earn a little extra money he worked at the airport for a rental car agency. What started there as a job to help pay for extra school expenses turned into a short career path for him. JP rose through the ranks quickly earning his own branch location, then as Area Manager, and eventually as a Regional Manager over Mid America stationed in St. Louis, Missouri. With their second child on the way, JP came to the realization that the corporate life of traveling every week would not afford him the ability to be the type of husband and father that he felt he was called to be so he relocated his young family to New Braunfels in early 2001. With a newborn and a three year old at home JP took a leap of faith and decided go into business for himself by starting his own insurance agency from scratch in 2002. 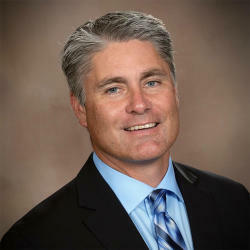 The JP Kesselring Agency of Farmers Insurance is now in its 16th year in business and going stronger than ever before. Over the years his agency has been recognized as the District Agency of the Year 6 times, and in 2015 JP was named to The President’s Council of Farmers Insurance, which is the top honor as recognition for being amongst the top 1% of all Farmers agencies in the nation. In 2011 JP graduated from The American College program called Life Underwriting Council Foundation as a Fellow, which is a designation recognized among top professionals in the insurance & financial services industry. Dawn is an elementary school teacher in NEISD, and their two sons both grew up in New Braunfels schools. Brandon (20) is now a student athlete playing football at Hardin Simmons University in Abilene while studying business in a pre-engineering program. Hayden (17) is a Junior at New Braunfels High School where he also plays football and baseball. JP is a graduate of Leadership New Braunfels Class of 2012, a Chamber Blue Coat, and a member of several committees including Leadership Planning, Business Trade Show steering, and Leadership Advisory. JP is the incoming 2018-2019 President for The Rotary Club of New Braunfels, 2016 Rotarian of the Year for The Rotary Club of New Braunfels, a three year Kleine Opa in The Wurstfest Association, a volunteer and build coordinator for Habitat for Humanity of Comal County for over 10 years, a Board Member for The Hill Country Chapter of Serve Outdoors, and a volunteer and past over-night host coordinator for Family Promise of Greater New Braunfels. In his free time JP loves to be outdoors experiencing God’s beautiful creation. To name just a few of his outdoor passions he enjoys hunting, fishing, hiking, boating, snow skiing, golfing, and taking rides on a motorcycle through the hill country on a beautiful day. Favorite all time musician or band? I have many, but being a percussionist I was most influenced early on by Neil Peart of Rush.